That’s right folks. England’s BBC just renamed Christianity. Church of England? To Hell with them. Protestants? Screw you. Catholics? Do not get them started. Not to mention that Abrahamic religions, with all their divisions and conflicts, are now in the BBC’s iron-sights. You have all been recategorized by a news organization that is still breast feeding America’s childish CNN. You are are all now AntiLGBTians. You heard it here second. England’s BBC reported it first. What a bunch of bigots. Its extreme leftist agenda revealed, the BBC goes after Christian school teachers world-wide. I promise. Two simple, yet powerful words. I swear. My solemn oath. The ‘promise’ is the most common form of contract known to man, and holds sway from the least of children to the greatest of leaders. Yet it is entirely unenforceable, for there is no controlling legal authority beyond the character of the promise maker. In politics the solemn oath of office is a satirical farce. The citizen knows the politician has no intention of keeping any promise or oath. For instance, in the United States, every politician swears to uphold and defend the Constitution, and then relentlessly attempts to subvert it. Why? The Constitution interferes with the politician’s ability to force their personal agenda upon an unwilling population. The ‘promise’ is also the foundation of journalistic integrity. A journalist’s power is found solely in their integrity. Journalists want their readers to believe they are credible, so they promise to be truthful and adhere to a code of ethics and fairness. Like politicians, journalists spend a huge amount of resources maintaining the illusion of honesty and integrity. Unfortunately, with no controlling legal authority, journalists, like politicians, often undermine public enlightenment with falsehoods and misinformation. Why? The truth often interferes with the journalist’s ability to force their personal agenda upon an unwilling population. From the Japanese internment during WWII to Obamacare, America’s history is rife with constitutional battles pitting the U.S. government against We The People. Today’s constitutional battle pits the majority of American citizens, who believe in the inherent value of the 2nd Amendment, against opportunistic politicians seeking to diminish the citizen’s right to bear arms. In this battle American politicians find themselves with a new and extraordinarily powerful ally, the British Broadcasting Corporation. The BBC’s journalists bring with them a finely crafted cloak of global integrity, a bully pulpit, if you will. The citizens of our world trust that the BBC will demonstrate the highest integrity in it reporting, so when the BBC sides with forces seeking to subvert the Constitution of the United States of America, the BBC legitimizes them. On January 16th, 2013, the BBC published an article that intentionally misleads its readers about relationship of lawful gun ownership and violence both inside and outside of the United States of America. 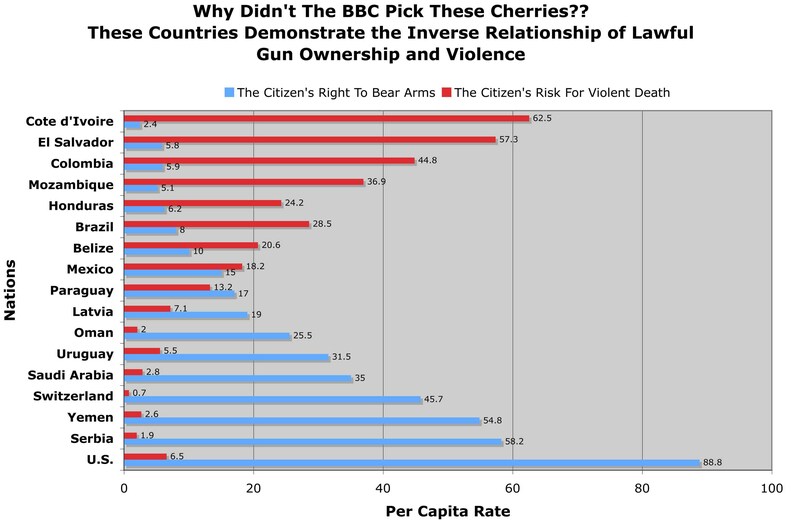 The article, titled US gun debate: Guns in numbers, http://www.bbc.co.uk/news/world-us-canada-20759139 cherry picks data and intentionally omits facts in order to frame the U.S. as a violent “outlier … when compared with other highly developed countries.” They put their data in a slick little chart, threw in a few photos of semi-automatic weapons, and made it a fait accompli. America’s lawful gun culture is at the root of American violence. No further investigation needed. 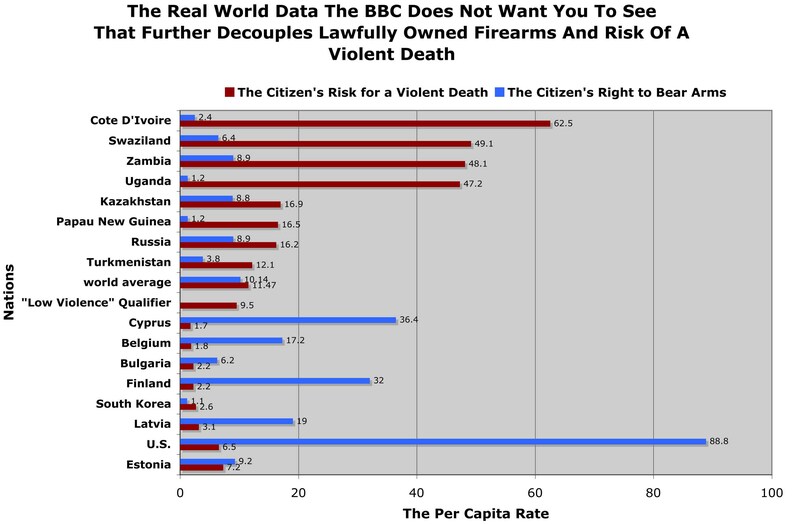 THE FIRST DECEPTION: The BBC is quick to point out that guns will kill 3.2 of every 100,000 Americans. That is over 30 times higher the United Kingdom’s extremely low rate of 0.1 gun deaths per 100,000! Ouch! What they fail to mention is that America’s overall death by violence rate is 6.5 per 100,000, and the U.K.’s overall rate of death by violence is 1.2 per 100,000. The Brits still kill each other, but simply do it without guns. Both countries are well below the global average of 11.47 violent deaths per 100,000. THE SECOND DECEPTION: The BBC claims that “On a global scale, this rate puts the US 26th in the world, behind Honduras, El Salvador and Jamaica,” for murder. This is not a factual statement. Worldlifeexpectancy.com ranks 192 countries by their rate of death by violence. 91 countries have a higher rate of death by violence that the United States. Actually, it is Guinea, the former French colony, who is in 26th place with a rate of death by violence of 25.3 per 100,000. The law-abiding citizens of Guinea own so few firearms they make the Brits look like gun nuts. THE THIRD DECEPTION: The BBC next claims that, “when compared with other highly developed countries, the rate shows the U.S. as an outlier.” This is another false statement where the BBC cherry picks their data points. Yes, the U.S. is a bit high, but is lower than Estonia, and not a far cry from Finland and Latvia, who are all peaceful, developed countries. If any country is an “outlier” it is the U.K. 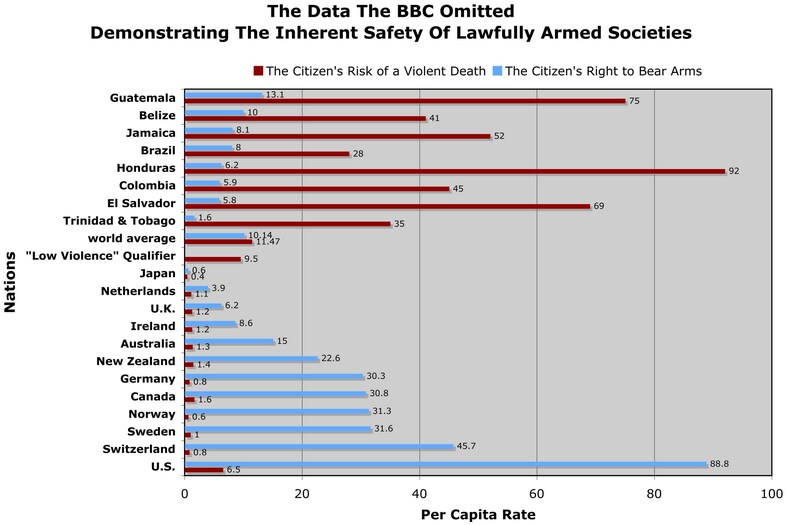 Most countries where citizens have little right to bear arms have extraordinarily high violent death rates. First, the U.S. murder rate has dropped 50% in the last twenty years, while at the same time private gun ownership has risen by nearly 50%. Second, about half of American murderers choose a means of killing other than guns. Third, statistics show a disarmed population is usually at a higher risk of death by violence. People are going to kill each other whether they have guns or not, and as the saying goes, “God made man, but Samuel Colt made them equal.” Criminals, terrorists, drug cartels, rebels, and corrupt governments all over the world arm themselves to the teeth with weapons often supplied through legal channels by one government or another. Taking away the right of law-abiding citizens to defend themselves simply creates a vast reservoir of potential victims. For example, Washington D.C. has some of the most restrictive firearms laws in the U.S. yet remains an intractable den of gun violence. Also, I am certain that the genocide in Rwanda would have had an entirely different outcome had all the victims owned the ability to defend themselves. SHAME ON THE BBC: Like it or not, journalists have an ethical responsibility to present honest, objective findings in the news. Readers believe, perhaps naïvely, that Journalists deal with them fairly and honestly, and take what journalists report as not only factual, but independent of government or cause. With great power comes great responsibility, and organizations such as the BBC have a moral obligation not to be the tool of, or mouthpiece for, any sociopolitical agenda, even if it is an agenda of their own creation. Maybe someone can buy the BBC a dictionary so they could look up the word, “shame.” After all, they own it.